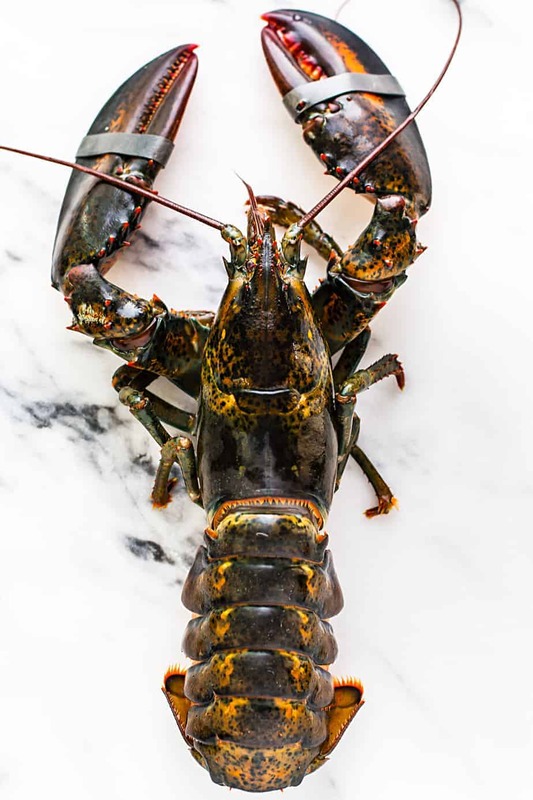 Learn how to boil lobster in salted water and a trick on how to cook live lobster humanely. 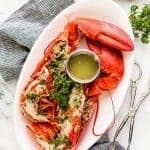 This Easy boiled lobster came out delicious served with lemon garlic butter dipping sauce. At the local market, I spotted some live, wild-caught Maine lobsters. They were big and priced right… next thing I know I’m home boiling them in a salted boil water. The cooking process for lobsters is so simple and the result is amazing! My husband and kids were pretty surprised to see me cooking up lobster but definitely enjoyed them for lunch. I often think of lobster as fine dining or something that I should be cooking up only when having special dinner guests. After cooking them on a whim so quickly and with such little effort I can definitely foresee us having more lobster lunches in the near future! 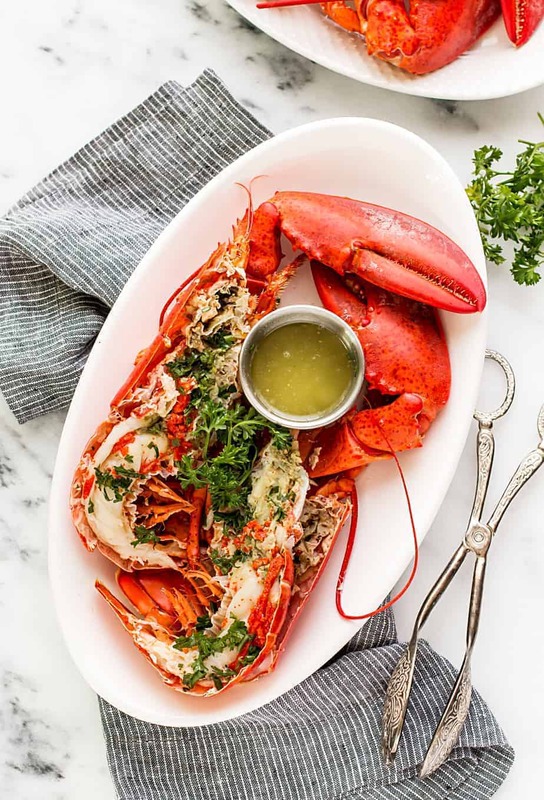 Hope you’d enjoy this easy boiled lobster recipe, served with delicious lemon garlic butter. With lobster’s higher sodium and cholesterol levels it’s not something you should consume every day. Lobster does, however, act as a good source of protein, vitamins, and minerals. It’s good to strike up a conversation with the people at your markets to learn where your seafood is sourced from, and any other additional information they’re willing to share. Keep in mind that one market may have better fish while another may have better shellfish. Being in a coastal city we sometimes have seafood vendors at our local farmer’s markets, but they’re often times sold out within the first hour or two. Boiling lobster is a little quicker and the meat comes out of the shell more readily that when steamed. To dispatch a Live Lobster Humanely : Put the live lobster in the freezer for 10-15 minutes to numb it. Fill a large pot with 2/3 full of water and add about 1-2 tablespoons salt per gallon. Place the lobster and cook for about 8-9 minutes for a 1 1/4 lb lobster or 9-10 minutes for a 1 1/2 lb lobster. When properly cooked, lobster meat is a creamy white color all the way through with no translucent areas. 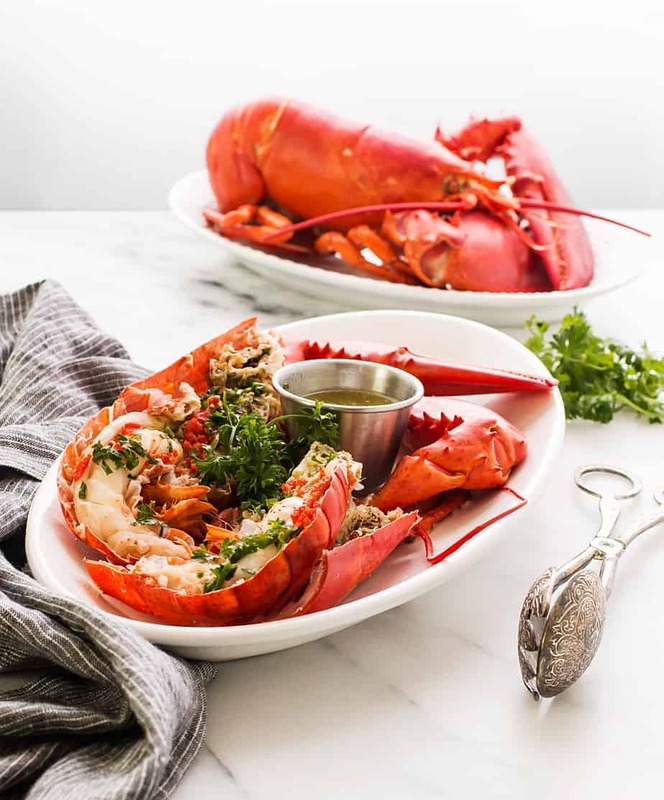 Remove the lobster immediately from the pot to stop the cooking process, then set aside to cool in an ice bath. For dipping sauce: Melt the butter in a sauce pan and add herbs, then quickly remove from the heat. I think of lobster as fine dining too – and never made it – on a whim or even for an elegant dinner so I sure do appreciate you breaking down the process! Gorgeous photos! One can never say no to a lobster dinner. Am I right or am I right? This one looks easy and delicious…perfection! Lobster is one of my favorite foods for date night. I’ve never made it at home, but I have a lobster dish I’ve been wanting to try. Looks delish! I so wanted to lick my screen right now. This looks delicious, my lunch never looks this good. I always thought cooking lobster was hard so Ive never tried it. WOW! Just WOW! I don’t even like sea food but I still want to eat this off my screen! Lobster is my very favorite food. I don;t have it very often, maybe once every two years. Mainly because I have never cooked one myself. This sounds amazing. That looks so good! Lobster is one of my favorites, and I love how simple this recipe is. There’s nothing like a meal of lobster. This dipping sauce sounds and looks absolutely delicious. I can’t wait to try this recipe. i love lobster but I have never made it myself. I had no idea it was so simple. I love lobster! Lobster pizza, lobster bisque, and lobster rolls!! I will be making your recipe soon!! Your pictures are stunning! I love lobster but have never made it myself before. Thanks for the recipe! We love lobster and this is such an easy way to make it up! I am going to give it a try! I do love lobster. This looks so good. It’s the dipping sauce that is really getting me. It has my mouth watering. I love seafood, lobster included and this makes me salivate lol. That looks super tasty and I am starving! that looks delicious! I’ve been debating making lobster tails in my instant pot. Maybe I should try the whole lobster! This looks delicious. I haven”t had Lobster in years. My hubby won’t eat it. Great recipe! My mom loves Lobster. I should make this for her soon. Good recipe and it was easy to follow.. 5 star, Thanks for the note on how to go about things humanely. How about a crab legs recipe now?